607 N Main Street in Winton, North Carolina is for sale for $50,000. Every now and again I come across a heartbreaker of a fixer-upper, and today’s Queen Anne in Winton, North Carolina is just that. But, you know what? It’s a new year. And with a new year comes high hopes that someone out there has the vision and determination to turn things around for the c. 1890 Northcott-Jordan House. Have you heard of this home? It’s also on the radar of Preservation North Carolina. Together, let’s try and get this old gal the loving homeowner she deserves! I was actually not so far away from this house last summer when I attended my friend’s wedding about an hour away in Norfolk, Virginia. If you love small town living near a beautiful river (the Chowan River in this case), then this house may be the project for you! Despite its current state of disrepair, there’s a lot of great detail left to love. The house will need a new porch floor and supports, but its roof is still there. How wonderful would it be to relax on a reconstructed wrap-around porch? And even though the windows are mostly boarded up, it appears from interior photos that a good number of two-over-two windows (if not all) remain. I love the two-story bay window. Even though the holidays are over, I’m always mentally putting a Christmas tree in any bay window I find (likely not a surprise to anyone who has followed this column from the beginning). Never hurts to plan ahead, I say! Speaking of the inside, just look at this dramatic archway near the entrance! I can’t get over how beautiful it would be when the home is brought back to life. The photo also gives us a peek at the entryway with its transom and sidelights. If you visit this house, I’d love to see more pictures. For now though I’ll have to get my fix from what I can see, like this elegant staircase and newel post. I can also catch a glimpse of some stunning window casings. Those are just one of the things that really make a great old house to me. That, and wood floors! It’s hard to tell in these photos, but the listing mentions the home features heart of pine and oak floors (a winning combination in my book). And, of course, a great old house isn’t complete without a decorative mantel or two to anchor a room. 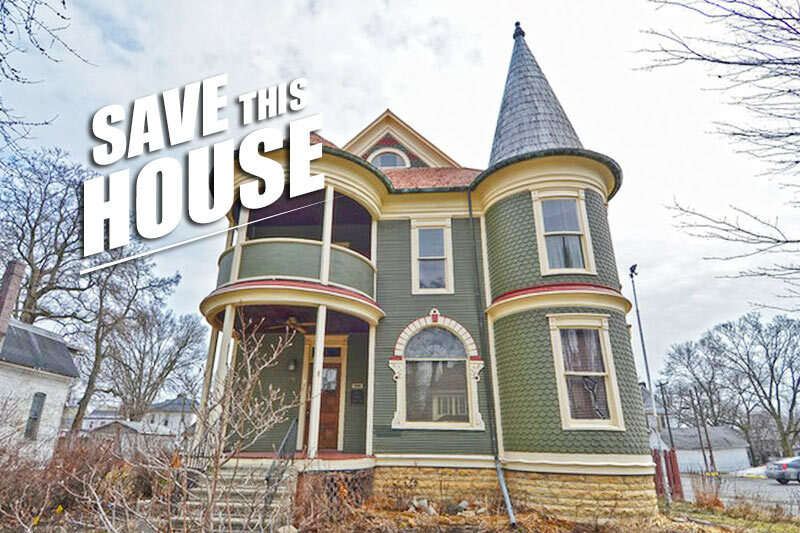 Please, someone buy this home and give those fireplaces a reason to glow again!